This post has been due for a while. I came across the Max Bupa Website a couple of weeks back and was really taken in. It's simple, gets the point across in an engaging format and sticks to its brand 'promise' of 'Your Health First'. The site has a great intro which is actually a montage of images. If you rollover the pictures, you get to see the health promises people have made - including a couple of celebrities - all of these look like endorsements. A couple of images also click to play videos. I thought the rendition was refreshing and different from the usual self animating intros we see on websites. 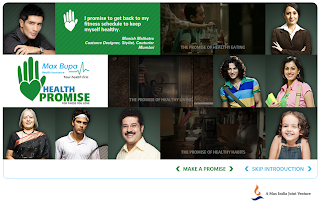 Once you get into the site, you can 'Make a Health Promise' (I needed to make one badly, to myself, and I did!). You can share your email/phone for Max Bupa to share tips (I hope this doesn't result in pesky health insurance mails & calls now!) or use Facebook Connect to share your promise with your online social world. The site has an existing Wall of Promises that users have shared, Health Promise Videos and some of the usual Health insurance site staples: Health Insurance Solution list from Max Bupa, Health Information basics and an Ask the Health Expert section.